Sonic the Hedgehog is twenty years old today, raise your glasses and salute. Sega introduced Sonic in the early nineties to rival Nintendo's cash-cow Mario and improve sales of the company's waning console, the Mega Drive. Until Sonic hit the scene, Alex Kidd was top bill at Sega and let's face it, despite appearing in an array of fantastic platformers, Kidd was never going to reach the heights of those charismatic plumber brothers. After several returns to the drawing board, Sega finally settled on a blue hedgehog as Kidd's successor. 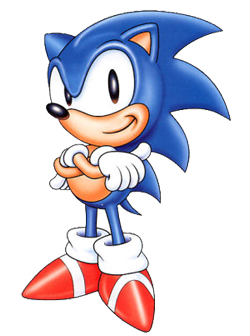 Initially codenamed Mr. Needlemouse, the team began developing what would soon become the classic game Sonic the Hedgehog. While Mario was all about pipes and shrooms, Sonic was a speed head, rushing through levels to save his furry friends from the vengeance of Dr. Robotnik. Released 20 years ago today, the game was a huge success and helped Sega claw back a foothold in the videogame market. Since then, Sonic has featured in dozens of games. When Sega entered the new millennium as a third party software developer, the spiky mascot even started to appear alongside his old rival Mario in titles for Nintendo consoles. The Sonic franchise lives on today. 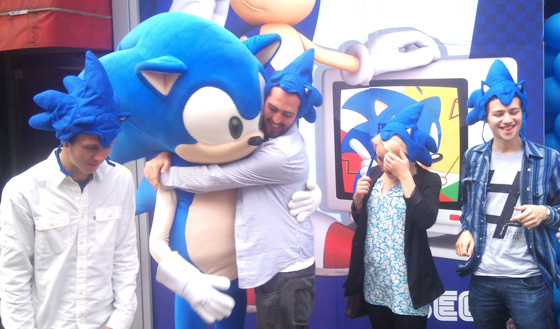 His 30th outing, Sonic Generations, was on show at E3 this year and hits shelves this October. I still remember my Sonic days like it was yesterday. Up, up, down, down, right, left, right, left, start. I was a cheating little eight-year-old. Happy Birthday Sonic.